Directions For CARBION+: MIXING - Add 8 oz. (1 cup, 237 mL) of cold water to your shaker per Serving (27g = 1 Scoop) of CARBION+™, seal your shaker and shake immediately upon adding CARBION+™. For 2 Servings (54g = 2 Scoops use 16 oz. (2 cups, 473 mL) of cold water. Additional water can be added if desired. 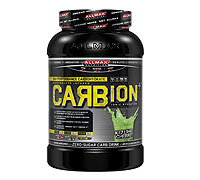 POST-WORKOUT - Use 1 to 3 scoops of CARBION+™ immediately following training, race or event. 1 Scoop for every 30 minutes of intense activity. Rapidly and completely refills depleted liver and muscle glycogen stores. Supports tissue and muscle repair. Quickly enhances. Ingredients and values may be slightly different depending on flavour.